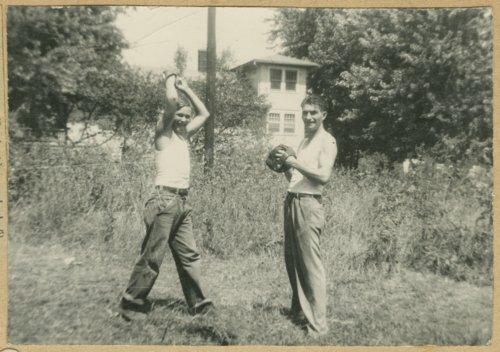 These snapshots from the late 1940s feature Paul Packer in various baseball poses. In the first image, he is shown with his father, who also was named Paul. The girl in two of the images (photographs 4 and 5) is Paul's sister, Edith. Packer grew up in the East Hill area of Topeka, Kansas, and he played baseball for several teams in Shawnee and Douglas counties as a youth and young adult, including Lecompton High School, the Topeka Mosby-Mack American Legion team, and the semi-pro Topeka Decker Oilers. He also spent a summer with the Ban Johnson team in Larned, Kansas, and later played fast pitch softball in Topeka for a number of years. Paul Packer had a 34-year career with the Topeka Fire Department. Digital reproduction of the scrapbook was accomplished through a joint project sponsored by the Kansas Historical Society and the Shawnee County Baseball Hall of Fame.